Qantas and American Airlines say the proposed deepening of their alliance will benefit consumers and allow the pair to compete effectively with the other carriers flying between the US and Oceania. The two oneworld alliance members have lodged their application for anti-trust immunity with both the Australian Competition and Consumer Commission (ACCC) and the US Department of Transportation (DOT). 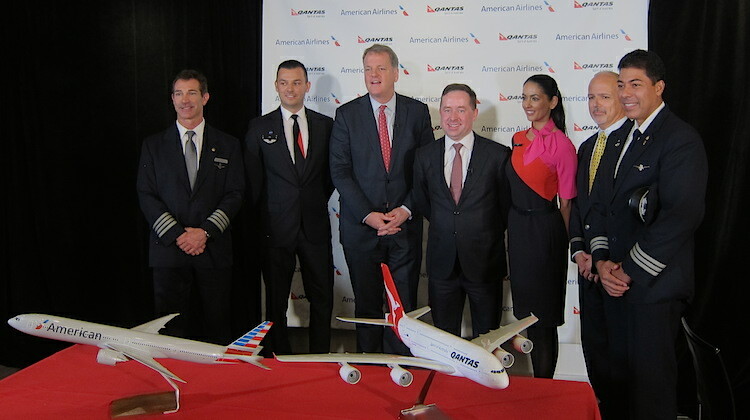 The application seeks to replace the existing joint business agreement (JBA) with a new alliance that incorporates a revenue sharing agreement and a “fully metal-neutral alliance structure”, given American is launching a daily Sydney-Los Angeles service with Boeing 777-300ERs starting in December. American, which last served Australia with its own metal more than 20 years ago, said previous equipment and labour agreement limitations meant it was unable to serve Australia, and therefore unable to enter into a fully integrated alliance with Qantas. However “those constraints have been removed”, paving the way for American to return Down Under. “The proposed alliance will do even more than the Original JBA, further increasing capacity, reducing travel times, generally improving the customer experience, and increasing competition,” American said. “The proposed alliance will allow American and Qantas to compete aggressively and effectively with the immunized Delta (SkyTeam)-Virgin Australia and United-Air New Zealand (Star) alliances, and provide a range of public benefits without substantially reducing competition in any relevant market. In addition to American’s new daily 777-300ER service, Qantas had announced a return to San Francisco, a city the Australian flag carrier stopped serving in 2011. Together, the pair will operate 45 return flights a week from Australia (Brisbane, Melbourne and Sydney) to the US mainland (Dallas/Fort Worth, Los Angeles and San Francisco). Qantas also flies to Honolulu, as well as between Los Angeles and New York. Figures in its submission showed Qantas carried 45.9 per cent of all passengers between Australia and the US in 2014. The percentage included those flying on its low-cost affiliate Jetstar, which serves Honolulu. The next largest carrier in terms of passengers carried in 2014 was Virgin Australia at 12.6 per cent, followed by United Airlines (10.1 per cent) and Delta (5.0 per cent). Qantas said neither it nor American could serve trans-Pacific routes alone, given the high number of connecting passengers travelling beyond the gateway cities. The Qantas submission showed on average 52 per cent of passengers on its flights from Australia to the US mainland were headed to destinations other than Los Angeles and Dallas/Fort Worth. “The success of Qantas’s trans-Pacific services remains dependent on accessing the breadth, depth and efficiency of the American network and sales and distribution channels in the US, Canada and Mexico,” Qantas said. Also, the pair was seeking interim authorisation for the alliance in order to begin ticket sales and promotional activity for American’s Sydney flights and Qantas’s return to San Francisco.